We live in an on-demand culture. Every service imaginable is geared for the convenience of the consumer … communications, technology, vehicles, on-line shopping. 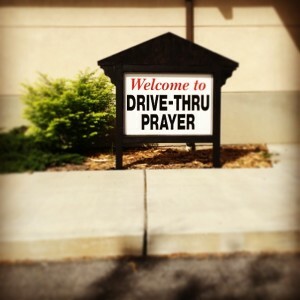 Witnessing the paradigm shift of our culture over the last five years, it shouldn’t surprise me that there are now drive-through prayer lanes cropping up all across the country. As Jim Denison states in his commentary of May 30, 2014 (Denison Forum on Truth and Culture), churches from Florida, Kansas, Illinois and California are offering drive-thru lanes, staffed with volunteers, to receive written prayer requests rather than speak directly to a church member. It’s almost like a prayer vending machine. Talk about convenience! At first I was offended. But upon reflection, I realize that while we are becoming more secularized as a culture, our human nature has an inherent God-shaped vacuum with “seeds of truth” planted in every soul. 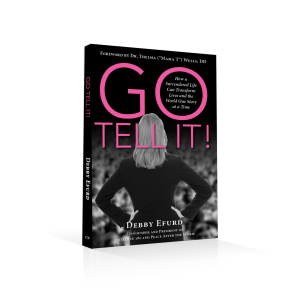 There is something in each of us that knows we need God’s help and need others to pray for us. Paul, the apostle, evangelist and missionary, asked the most dysfunctional, immature church of his day (Corinth) to pray for him. If he needed their intercession, don’t all of us? Corinthians 1:11 You must help us by prayer, so that many will give thanks on our behalf for the blessing granted us through the prayers of many.